I mean that thing is made by a child from decades old balsa wood. I would have been scared to fly it in the 80s, I'm sure it is even less structurally sound in the new Willennium. It's still not done either, so I'm not tempted to take it out just yet. FliteTest has such a variety of plans that I'm working through them and gaining experience, edging toward flying this artifact at some point. 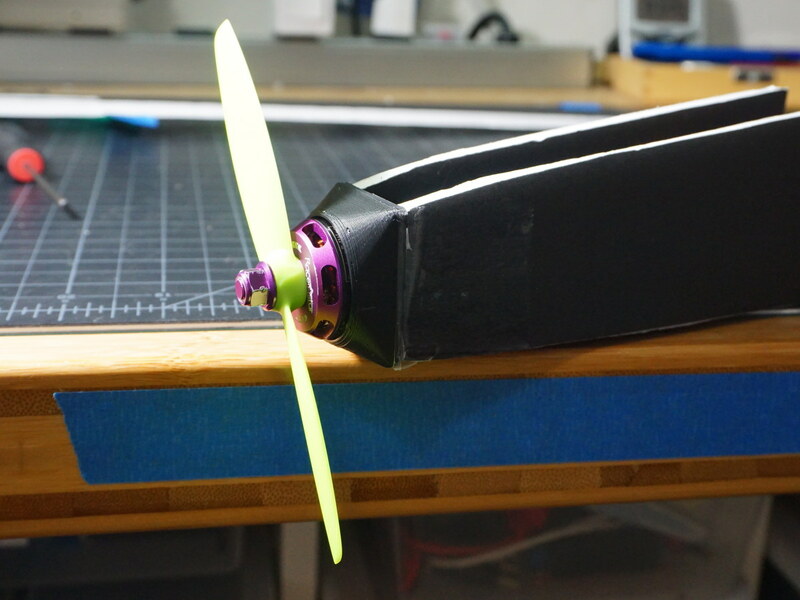 With that motivation, I recently built the 1520mm wing from the Ridge Runner article and slapped it on a Tiny Trainer. I was concerned about getting the undercamber right so instead of cutting the guides from the plans and introducing my signature 1mm slop into it, I just made some 3D printed guides to form the undercamber. The wing is giant on the TT, but it worked ok. The wing itself weighs in at just over 150g so the 1806 2300KV motor and a 6x4.5 prop with 2S just wasn't cutting it. It tips the scales at 430g with an 800mAh 30S so it is a little heavy. I swapped the A pack motor for an F pack, which works much better but this TT has seen so much action having crashed dozens of times and spent up to a day in 6 different trees. 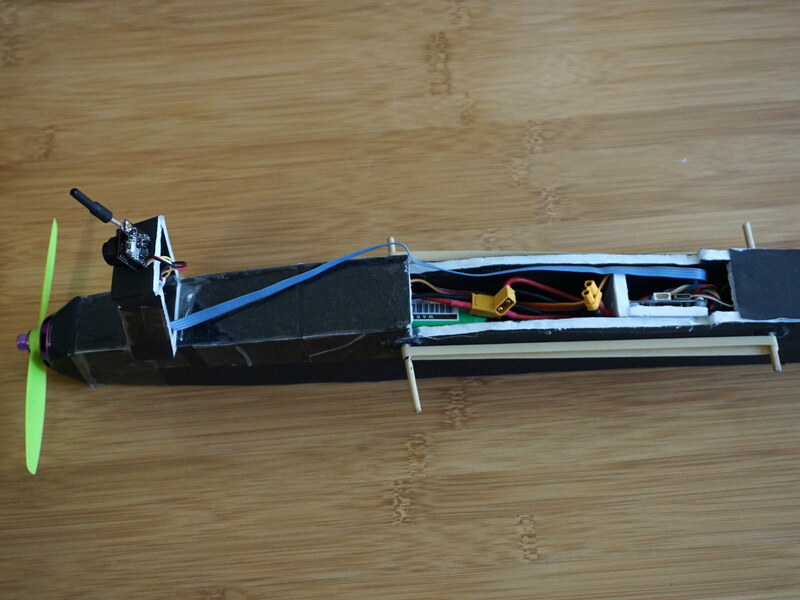 The rudder is also too small for the size of this wing so even at 100% throws, it can sometimes be difficult to turn. Continuing this build, I'm working on a new fuselage from the Ridge Runner plans. I've modded them to increase the width of the fuselage from 20mm wide to 26mm wide to accommodate my 3S battery, and cut off the nose to hold a the motor. FPV with OSD. This is what we're really after with this build. A long duration flyer that lets us cruise around sipping little power from the battery in a hyper efficient manner. I had to work all weekend so I've got flex time today to kick this project into high gear and keep heading down the path to that Gentle Lady. This isn't really a scratch build which starts from nothing and ends up with something new and amazing, but the Ridge Runner doesn't have much visibility here so I figured it wouldn't ruin anyone's life to have it tucked away here. I'll post all my modified plans and 3D models as well. That counts as something original right? Might try looking at the fuselage of the Simple soarer it looks like the runner in a few ways and I am sure can support that wing too. Ohhh and good luck, watching this . We're gonna move fast because we gotts to go back to work in the solder mines tomorrow. I had a FT Simple Soarer on my possible build list but I just love me some lift so I wanted to give the high aspect wing design a try. Undercambered too? I couldn't try to build that wing fast enough. The first hurtle to overcome was to convert the plans over to using DTFB. The original design was for A0 (841x1189mm, 33.1"x46.8") so it is way too big to fit onto 20"x30" foam board. I used Inkscape to break the plans apart and re-assemble them. 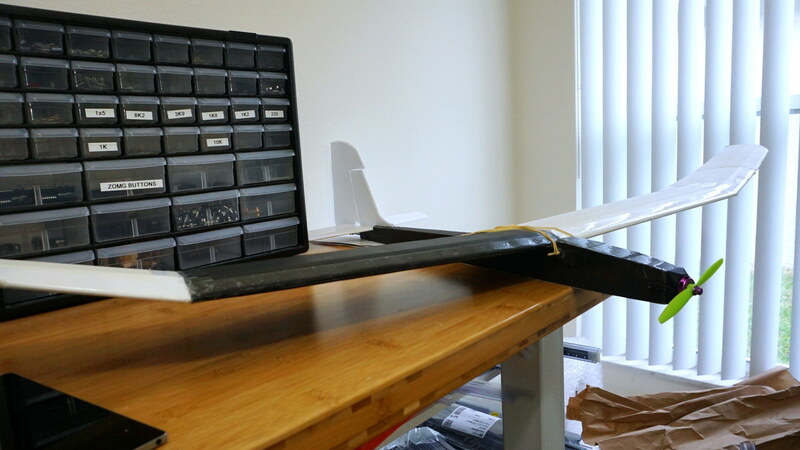 The wing would need to have the tip broken off and built separately, then attached. 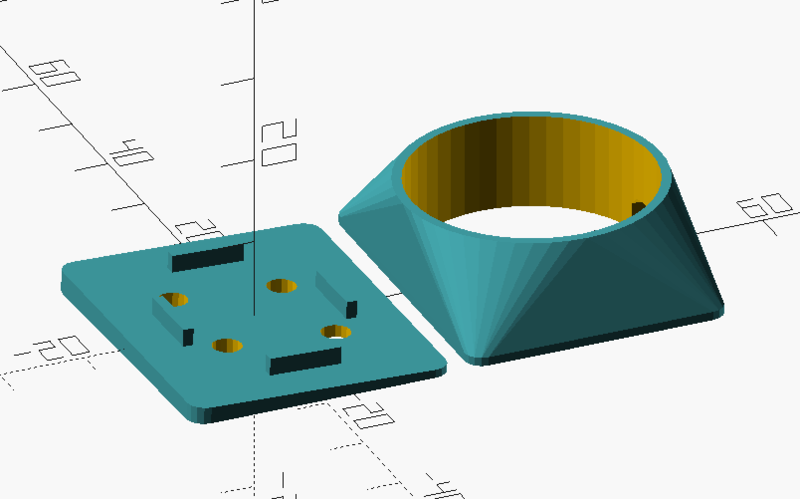 This isn't a big deal because the polyhedral at the tips needs to be set anyway. The wing was done a week ago so this bad boy is coming together in a hurry. 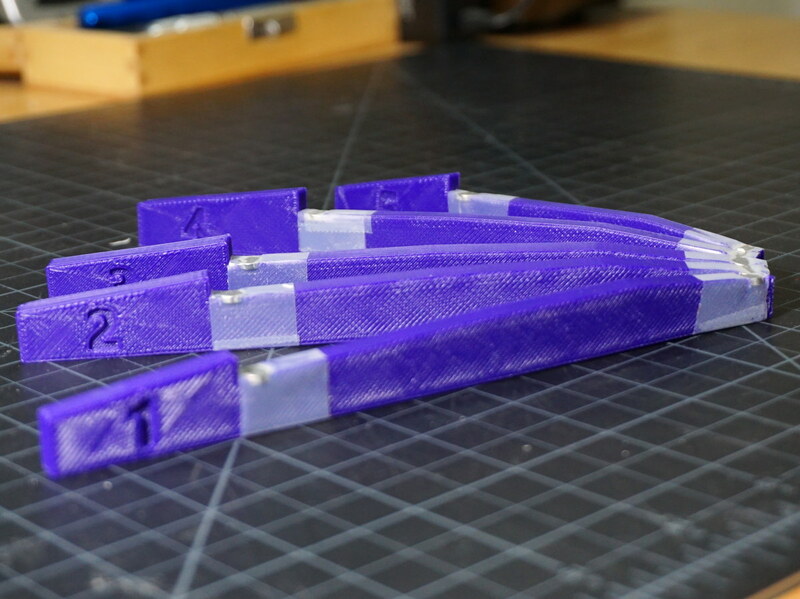 I also adjusted the fuselage center out to be 26mm from the 20mm standard size. My 3S battery already has velcro on one side so I didn't want to have to take that off and it wouldn't fit in 20mm. They say write what you know, and always make sure your battery can fit (I am paraphrasing here) so this was key. The 2205 motor is also like 30mm wide so I need to make sure the nose is wide enough to mount it. I am not good at Inkscape so all I did was go to all the points that formed the center of the aircraft and move them each 3mm up/down. 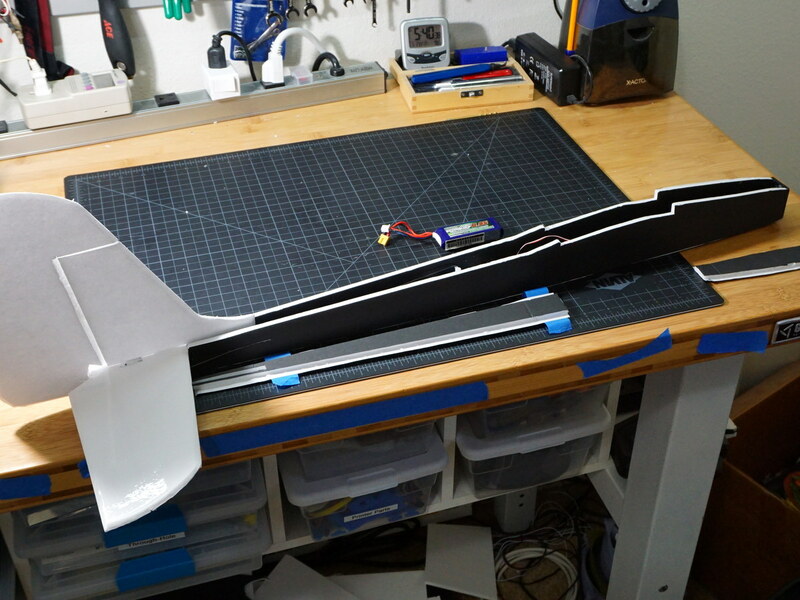 Note that the fuselage is too long to fit on the 30" dimension of the DTFB so just make sure the tail is on the foam and the nose hangs off the end. We're going to be cutting some nose off anyway. The HStab and VStab are just the standard size, but I put them in their own files since it is easier to tile together the pieces. I definitely miss Sp0NZ's tiled plans with the nice alignment marks because it is like trying to make a baby-- it is hard to tell how much the lines have to overlap to get it to come out right. The rudder on this thing is MASSIVE. I mean it is like a whole sheet of paper by itself. I have concerns though because the hinge is raked backward. This means that using the rudder also will have a pitching effect. Is that desirable? It seems like a bad idea to bake rudder and pitch together. You'll see I also made a 3D printed firewall and engine cowl. The firewall is just hot glued to the nose with a strap of heavy duty packing tape over it. I've done this with pusher planes before and it works great, but I just realized that the force here is trying to rip the motor off and fly away so I am worried about the strength. I baked 2 degrees of right thrust and 1 degree of down into the firewall because I know from the prototyping with the Tiny Trainer fuselage that this bad boy is going to want to climb under power like Spock up El Capitan. I'm not sure if this is enough but we definitely need some, and my 3D modeling skill is not the best so we can't do much more without having to fix the angle of the screw holes and (zippermouth) not sure how to do that. I've attached the split up plans along with the 26mm fuselage. Tragedy! To make sure the motor cowl didn't rub on the motor, I wrapped a piece of paper around it and then CA glued it to the firewall. 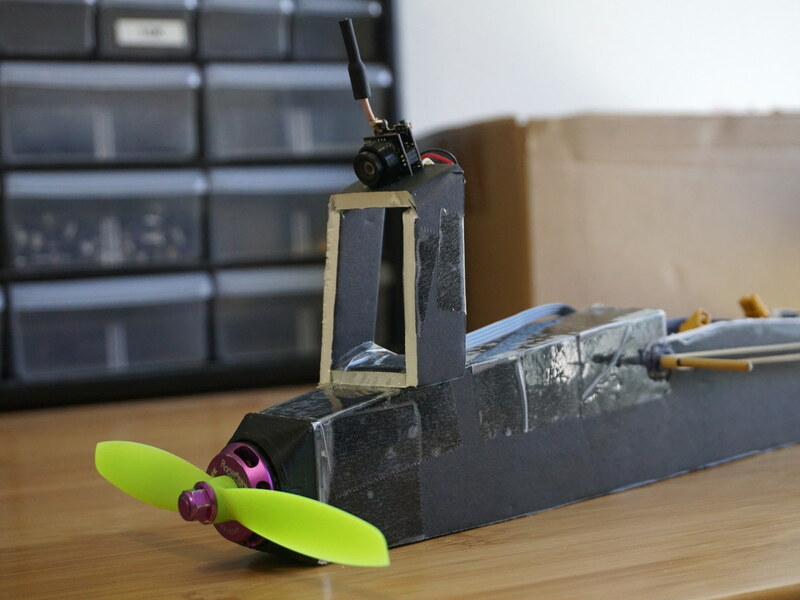 The CA seeped through and glued the paper to the motor to the cowl completing the trifecta of immovable objects. I ended up having to crush the cowl with pliers and then pick the pieces off. Parts of the firewall came off too so I just sliced it off and made a new design, this time with a rim around the inside as a spacer instead of the paper. I also 3D printed some reinforcements for the BBQ skewers to pass through. 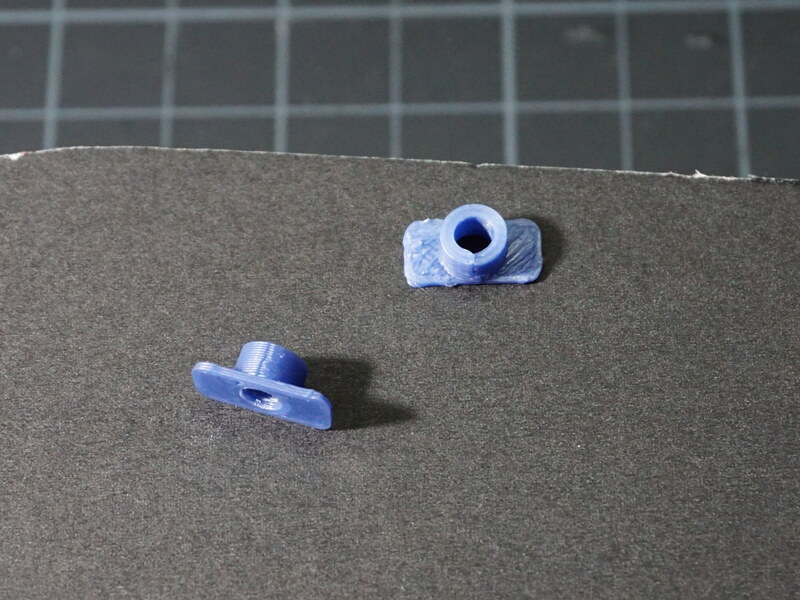 These have sort of evolved with my builds, from simple washers to reinforced washers, to rounded rectangle plates, and now these sort of grommets. The idea is that you drill out a larger hole then insert the barrels into the foam. Drilling kinda tears up the foam inside so I'm not sure these are a good idea, but we'll see how they hold up after a few of my patented terrible landings. Looking good can’t wait for the maiden video. 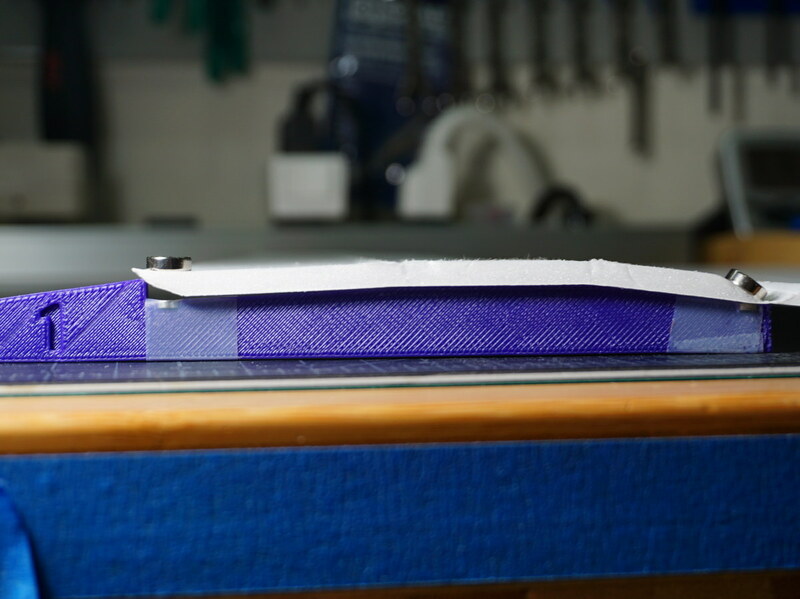 I cut the horizontal stabilizer on the high side, used a little denatured alcohol to remove some hot glue, and carved out a bit of foam. I reglued the stabilizer here so it is closer to even with the wing which is a compromise. Just couldn't figure out how to open up the fuselage to untwist it, so the fuse will stay twisted but the tail will be in line with the wing. You won't have to wait long. I couldn't resist getting it out just to see if it would crash and end this build. It didn't (and with zero clicks of trim)! The wind here today is 8kt gusting to over 25kt so this slope soarer design is really in its element. Once it got up and the wind would blow it sideways I decided to call the short maiden a win. The Ridge Runner fuselage does seem better suited compared to the Tiny Trainer, which has a ton of pitch change when going on and off thrust to the point it is difficult to transition without stalling. This just relaxed going forward and tucked in a bit when I slowly dropped throttle. 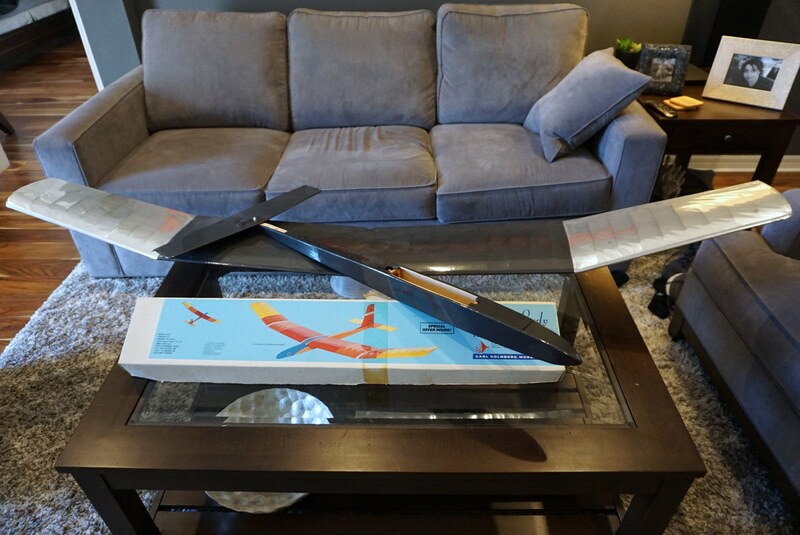 Landed a little long but was worried about the gusty wind flipping my new model before I could get it fully built. It just occurred to me... can iNAV fly 3 channel? I just remembered that it only turns using ailerons so what happens if you put a yaw output as the roll output? We. Shall. See! You really didn’t make me wait long . Great maiden, great call to bring it down and call it a win. I heard in your voice the ohhh no at the end but you landed her like a pro, great work! Looking forward to see more of this soon. great maiden in that much wind ...well done !! i have a modified simple soarer that flys like that ...up like a rocket and just hovers in the wind when the power is cut ....so much fun to fly !! @CapnBry - I really enjoyed this thread - I have been chicken to get up so high, even @mayan has suggested as much - I am a fan of the RP motor mounts (use them myself) - my first FB was called the fish with an undercambered wing - I now need to check out the ridge runner in more detail! Yeah! I am really encouraged by the flight. The giant rudder came in handy as I was still in control even with the gusty winds. Not so much that I was confident in trying to land it closer to me, but still pretty sweet. Today is supposed to be more calm but there's a cold front so now we probably won't have much thermal activity. I usually glue down a little mount for the flight controller and screw it down, but the Ridge Runner isn't wide enough so it will have to stand on its side. I made this little mount that slides down inside and with the rubbery hot glue on the edges it stays pretty firmly in place. 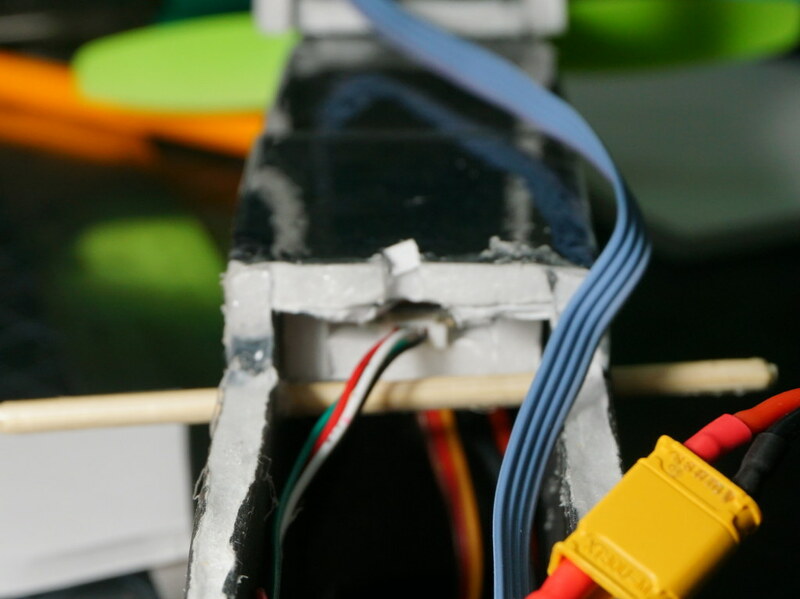 Problem is that with pinheader installed, the servo / esc wires just barely do not fit due to the double foam thickness of the mount. This means I might make a cable to connect to the 1.25mm PWM output port instead of the regular 0.1" servo pinheader. 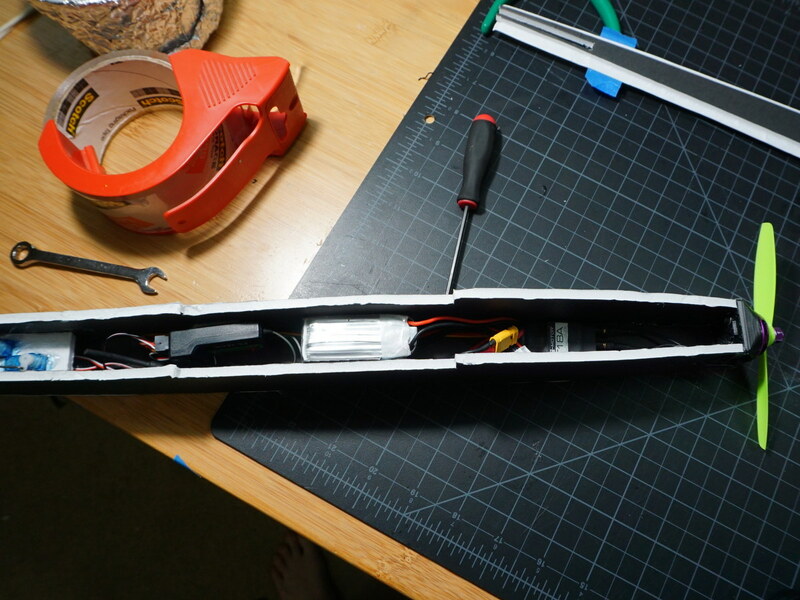 The battery is also a couple of inches forward of where I expected things to balance out, so I am a little concerned about it being too close to sitting on the ESC in the nose. 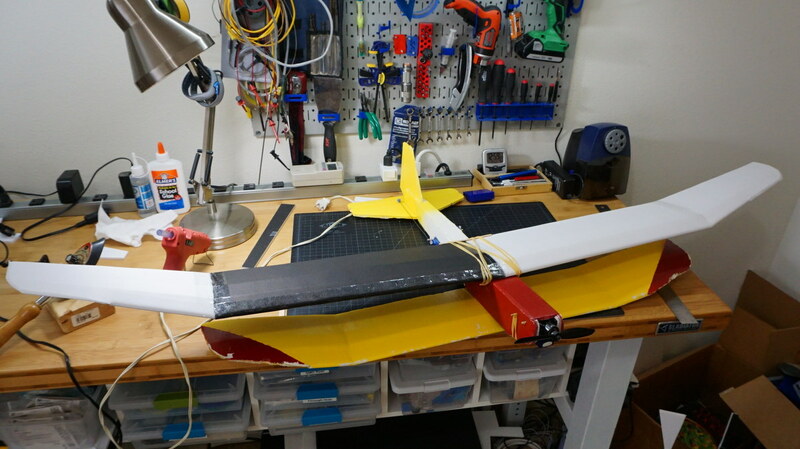 If I have to add nose weight, I might swap the motor for a 2212 (B Pack size) motor, which is 20g heavier but can attach a larger folding prop. 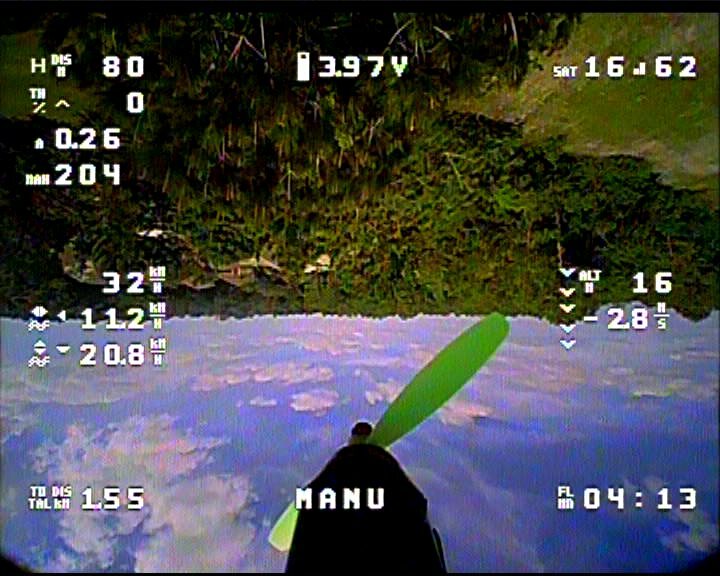 I managed to bend the little 5x3.5 prop a little yesterday despite having ESC braking on. Granted, I have something like 30 of those in my prop box but I'd hate to bend one on every landing. This is the part that takes the longest, getting that last little bit done with all the electronics! Oh I suppose I haven't gotten to the FPV portion yet either but I'll get some flights in without it first. Oh cool! I'm checking out your other thread and I hope you can get some video of your learning slope soaring. I'd love to slope soar but there ins't even a 100m tall hill in all of Florida so I'm a bit jealous of you coastal kiwis. When Andrew Newton did his "ultralight" slope soaring comparison and he did all those graceful acrobatics I was really amazed. @CapnBry - Easter is coming so hopefully I can get some flights in - I have been using a 1000kVA motors exclusively with bigger folding slow props - 11x6 and 10x5 - they seem to work well with my 3c 2400 and 2c 1300 lipos - no prop damage either! I really enjoy the building side, but I really really need to crack the flying side! @CapnBryI really enjoy the building side, but I really really need to crack the flying side! Haha this sums me up perfectly too. Sure, my entire dining room table is covered with a perfectly flyable FT Mini Scout, a 75% size FT Goblin, a Tiny Trainer, an FT Explorer, an FT Mustang, and a Gentle Lady, but why would I go fly something when I can build something? I think I feel marginally more in control when I am building than when I am flying. Awww son of a biscuit! I just realized that I ran out of room on my hatcam's SD card about 30 seconds into my evening flight. Funny as I was driving over to the park I was trying to do some mental math to figure out how much the 32GB card could hold. I guess it is ok though because I was pretty far away most of the time. This plane floats around like a dream. The wind is 2kt gusting up to 5kt and it is about 30C out there despite it being 13C this morning. I flew 10 minutes and when I landed the 3S battery was at 12.0V and the charger says I only put 254mAh back in. Why did I land? I got a little shook up because I heard a general aviation plane in the area and as I turned my body it was right there. I'm 15 miles from the airport, flying at 75m and this guy was cruising by at what looked like the same altitude to me and within 100m of my model. I pointed the nose at the ground and landed immediately but for the first time I yelled at an airplane. I checked the FPV camera and didn't see him on it so I guess he was a little higher than me, but man, that was unpleasant. Just for testing angle and placement, I mounted my cheapie FPV camera up on the nose with a 30 degree down angle with some packing tape. It probably should go a little further forward and with a little less angle so I get less prop in the view. I was going to edit the FPV video with the hatcam video but without that hat footage I'm just going to post the raw FPV stuff so we can all marvel at how well this flies. I also hooked the rudder servo to the "Stabilized Roll" iNav output and it kinda works maybe a bit? I won't be able to tell for sure until I've got the GPS in there and it can loiter, but I can fly around in ANGLE mode despite the roll actually controls the yaw (and the roll secondarily). I should also say the current sensor isn't working right, it always reads 0.2A despite having the right constant. I'll work on that tonight too. EDIT: haha I soldered the power wires backward so the current sensor is working in reverse. Good job, me! @CapnBry beatiful video! Seems you lost singal there a few times any idea why? FYI I also get normal planes flying over the field sometimes and have to pitch down to avoid a colision, hate that, but ohh well it is what it is. Oh nice! Yeah this mount was my 10 minutes of effort to try it out. I've flown with the camera before stuck right to the fuselage and felt like I couldn't see a thing, since half the image is sky and most of the other half is airplane. I wanted to see how high I needed to go, how much angle is acceptable, and if it would make me dizzy to be looking down all the time. I think eventually I might 3D print something for it because this is the opposite of durable. @mayan I think the biggest of the dropouts came from when I was pretty much directly over the receiver. 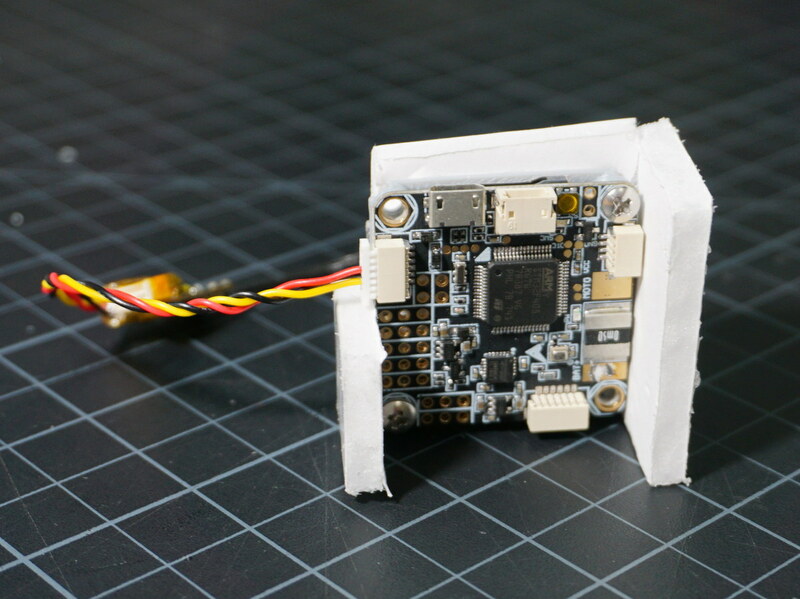 It is just one of those USB dealies that plugs into my phone (like an Eachine ROTG01) so it only has a single linear antenna, and the camera only has a linear antenna, so when I fly directly over I get into the null. I think the antennas were slightly angled though because it looks worse when I pitch down which would indicate that the antenna on the aircraft is angled slightly backward or the one on the ground is angled slightly away. I have some EV800D box goggles as well and those experience even worse dropouts when flying overhead (with the standard RHCP omni and patch antenna). It kinda stinks because my field isn't giant, and the trees block the reception if you're flying low, and the antenna nulls cause dropouts when flying across the center of the field. It means the only really good place to fly FPV is around the perimeter of the field below tree level. That's fun but I can run around with my legs at that height and see things with my own eyes. I want to see things up in the air! I'm happy to hear that encountering aircraft isn't unique to me, but it does make me a little uneasy about being up close to the FAA 400ft limit if people are going to be cruising by down close to their lower limit. 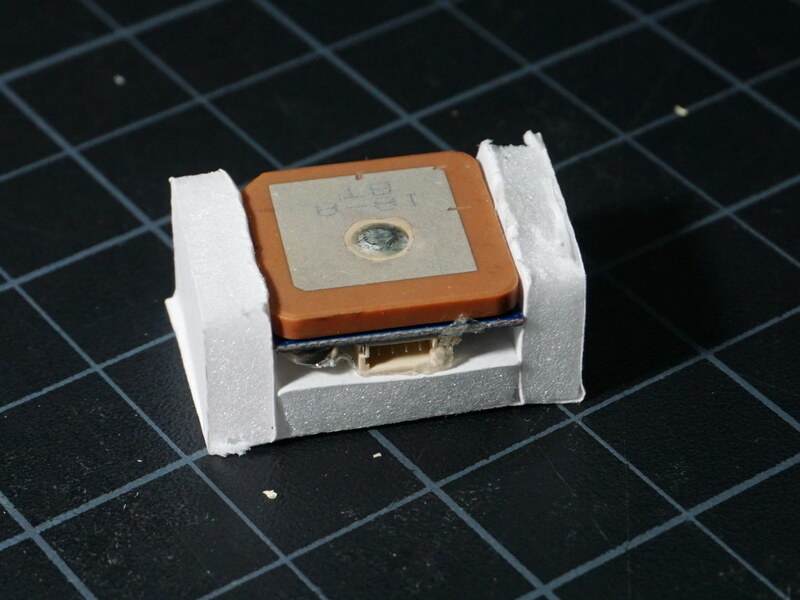 I made a little foam cozy for the GPS module to sit in and glued it up under the nose. The battery just barely squeaks by under it but it gets good signal in that a cold start took just a few minutes to lock 7 satellites indoors. Speaking of a world sideways! Things went pretty well. iNav was able to RTH and navigate using the rudder! I got a little too aggressive with the PIDs though so it was swimming through the air with the tail thrashing back and forth. I ran into a bit of a problem when flying FPV, which is that my brain says to put the horizon in the center of the screen, which is actually over 30 degrees of pitch up. I kept stalling and then when I gave it a lot of throttle to regain control, the nose went straight up and a gust of wind blew me inverted. 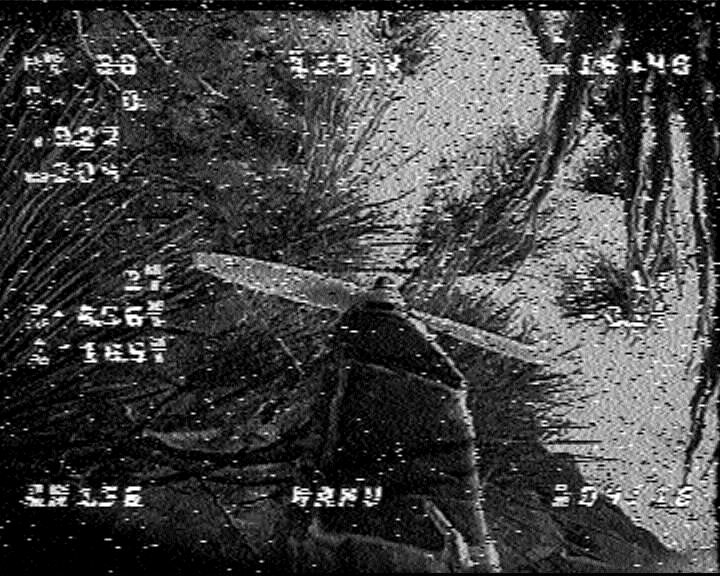 Flying inverted with the power off and just a couple meters over a stand of trees at the time was not a great combination. I was pleased to see in the blackbox logs I was giving it the right controls to fly and avoid a crash but I managed to narrowly avoid success and ended up in a tree. Minor setback because the only damage was the camera mount which we were going to change anyway. I am having some problems with the iNav + FrSky R-XSR with F.PORT though. The telemetry was working fine before I added the GPS, but now I get "Sensor Lost" after "Sensor Lost" after "Sensor Lost". If I disable the GPS, it works again :/ I think there's too much telemetry being sent?